The Tempra® series has been redesigned completely inside and out - upgraded heavy-duty electronics, a simple single flow sensor design, a hinged cover for easy access, and Tempra Advanced Flow Control™ for the Tempra® Plus. 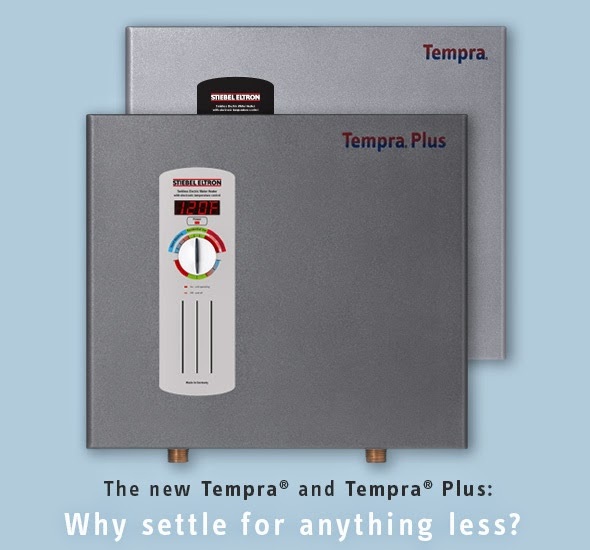 he Tempra® Plus is the most technologically advanced tankless water heater available on the market today. Tempra Advanced Flow Control™ is exclusive to the Tempra® Plus and ensures a constant temperature output no matter how great the hot water demand is. Tempra Advanced Flow Control™ technology works by automatically adjusting the flow of water to eliminate unpleasant temperature fluctuation. What that means to you is a consistently satisfying experience every time, all the time! The new Ariston GL6S Plus electric mini-tank water heaters have just arrived. This water heater is the direct replacement for the recently obsoleted Ariston GL6+ (GL6PLUS). The main difference between the older GL6+ and the new GL6+S is that the GL6+ came with a power cord that plugged directly into a 120V wall socket while the new GL6+S does not come with a power cord. The GL6+S must be hardwired at the time of installation. Dimensions: 17.5" x 17.5" x 14 1/2"
The new Ariston GL6+S model has many new improvements since it has been upgraded. The mini tank has a new temperature adjustment knob on the front of the unit to raise and lower the temperature from 65 Deg F to 145 Deg F. On the older model you would have to remove the blue oval cover to access the temperature knob. The Ariston GL6+S model has a new improved thermostat that features a new sensing probe that is attached to the thermostat and inserts into the cavity of the new element so the heater can adjust temperatures quicker and maintain a more consistent heat. Designed by the world's leading point-of-use water heater manufacturer, the New Ariston GLS series combines Italian design and state of the art features including glass-lined tanks, a 6-year warranty and highest recovery time. Installing an Ariston electric mini-tank water heater under the sink puts hot water right where you need it - at the point of use. Lightweight and compact and also the Ariston mini tank heaters are great for those long hot water runs from your tank heater or tankless heater and will shorten the wait time for hot water. The New Ariston GL2.5S mini-tank electric water heater stores 2.5 gallons of hot water. The New Ariston GL4S mini-tank electric water heater stores 4 gallons of hot water. Please note: The New Ariston GL2.5S is not the direct replacement for the Ariston GL2.5 as the Ariston Gl2.5S is 10 3/4" in depth and the older Ariston GL2.5 was 10 1/4" deep. The new Ariston GL4S is not the direct replacement for the Ariston GL4 as the GL4S is 13 1/2" in depth and the older Gl4 was 12 1/4" deep. The replacement parts for the new Ariston GL2.5S and the GL4S will not work for the older GL2.5 and GL4 mini tank heaters. Dimensions: GL2.5S-13 3/4" x 13 3/4" x 10 3/4", GL4S-13 3/4" x 13 3/4" x 13 1/2"
The new Ariston GL2.5S & GL4S models have many new improvements since they have been upgraded. The mini tanks have a new temperature adjustment knob on the front of the unit to raise and lower the temperature from 65 Deg F to 145 Deg F. On the older models you would have to remove the blue oval cover to access the temperature control knob. The Ariston GL2.5S & GL4S models have a new improved thermostat that features a new sensing probe that is attached to the thermostat and inserts into the cavity of the new element so the heater can adjust temperatures quicker and maintain a more consistent heat.